Vows to adjust Ilum to "discourage" exploits. BioWare has explained the recent spate of Star Wars: The Old Republic bans - and promised to adjust areas players are exploiting. Last week a number of players were banned from playing the sci-fi MMO for looting containers in planet Ilum at too low a level - a move that sparked outrage from the game's community. 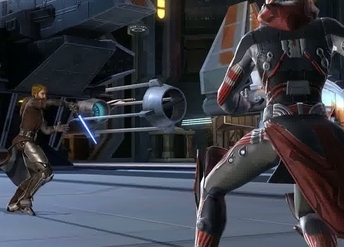 Community manager Stephen Reid took to the SWTOR website to explain what had happened. He said those who had been warned or temporarily banned "were systematically and repeatedly looting containers in very high numbers resulting in the game economy becoming unbalanced". "To be completely clear, while players may choose to travel to Ilum earlier than the recommended level (40+) and may loot containers if they can get to them, in the cases of those customers that were warned or temporarily suspended, they were systematically and repeatedly looting containers in very high numbers resulting in the game economy becoming unbalanced," he said. "None of these accounts were banned for their actions and no accounts have been banned for travelling to Ilum while still relatively low level. By comparison, the number of accounts that were warned or temporarily suspended was considerably lower than the number of accounts banned for 'credit farming'. "It's important to remember that our Terms of Service team is extremely careful and thorough in their investigation of any potential exploit or unusual activity in-game. Working closely with the development team and using extensive metrics based on player activity, they are able to determine what is normal player activity, what is unusual and what is exploiting. Our goal is always to ensure a fair game experience for all players while also protecting the rights of individuals, and if people are disrupting the play experience for others action will be taken." Reid added that BioWare may reverse a ban decision if the case merits it - but warned against taking online player reports at face value. "While we will not discuss the details of any individual action, whenever we take action against an account we believe they have clearly broken our Terms of Service," he explained. "Any action taken against an account can be appealed and in some cases actions have been rescinded. "While we understand people's concern about actions taken against accounts, please remember the Terms of Service team exists to help ensure a balanced and fair game experience for all. When you see reports of actions taken against someone's account, remember they are choosing to tell their version of the story - and there are two sides to every story." BioWare vowed to adjust Ilum "in the near future" to "discourage" exploits. For now, though, the planet remains open to anyone who wishes to travel there. "The goal of the Star Wars: The Old Republic team is to maintain a service for our customers that is fun to play and equitable for everyone," Reid concluded. "Critical to this goal is making sure that gameplay is fair and reasonable and we are constantly on the lookout for anything that would prove to be a detriment to your gameplay experiences." Are you Hoth or not? Remembering 2016 for Alderaan reasons. Knights of the Eternal Throne expansion touches down in December. Due when the game turns five years old this autumn.